Making Practice Easier by Making It Attractive – Love. Life. Practice. I’m sitting in Boston Logan International Airport, looking out at the cool airplanes from the comfort of a nice wooden rocking chair. Thanks to several of the practices I talked about in the last trip, it’s been a pretty smooth travel day, including productivity like writing an article for a client on distance technology and relationship building as well as taking care of customers from other websites. But it also included listening to two of my favorite podcasts – Dan Carlin’s Common Sense and The Art of Manliness. The latter had an interview with Mark Divine, creator of SEALfit and author of “The Way of the SEAL.” As you might expect, the guy is a former Navy SEAL, and does a lot of work bringing the SEAL forms of training into the civilian world. Interestingly, he also has apparently consulted with the Navy to bring several Eastern forms of training – meditation, aikido, and yoga, to name a few – into the intake process for SEALs, with positive results. And it’s for the usual reasons – as Jess over at Dirty Yoga would say, I can’t figure out how to win. But even though I’m a former jarhead, I admit that occasionally the SEALs have some pretty good moves*. Hearing that part of their situational awareness training designed for the most covert, the most dangerous, the most totally-outta-hand missions is to do some downward dog and camel’s pose while breathing deeply into their d’an dien suddenly has me impatient for my own next session. While I am constantly a student of becoming self-aware, I am also a product of my culture, conditioned by my upbringing with certain mythic resonations such as the SEAL. When I was twelve, that meant I created “The Star Wars Workout” with Han Solo Pushups and Jedi Balance Moves and the like (my parents were quite indulgent). Now it’s a little more graceful and hidden, but you can bet that when I next lift my spine and try not to re-invent Fallen Tree Pose I will be, on some level, imagining that I am doing the same exercise that the fiercest warriors of my time do. Am I really going to become a SEAL doing yoga? Of course not. 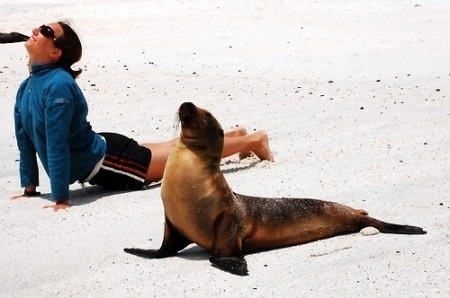 But I will benefit from doing yoga, and if imagining the SEALs doing it gets me on the mat, that’s a good thing. So whatever that thing is you wish you did more of – writing, maybe? – try to find out who else does it. There’s probably some person, some career, some archetype that you can latch in on. You can borrow their strength to help you through your own personal journey, and the burden of building a habit will be that much lighter.